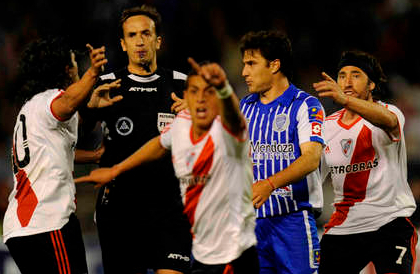 Sunday saw the weekend’s Primera División matches end on a controversial note, as Rogelio Funes Mori scored a fine winning goal in the last minute for River Plate – away to Godoy Cruz – only to see it ruled out for a phantom hand ball after he’d brought Ariel Ortega’s chipped through ball down with his chest. That game finished 2-2, with Godoy worth their point and claims that Jonathan Maidana was fortunate not to have given them a penalty in the first half (I can’t comment as I missed most of the first half, including that incident). Mariano Pavone, though, was clearly offside when he scored River’s second. Elsewhere on Sunday, Boca had dismissed Huracán 2-0 – ironically given Funes Mori’s later frustration, Martín Palermo accidentally handled just before scoring the brilliant opening goal, and the officials didn’t spot it – and Olimpo beat Lanús 1-0 with one of the most perfectly-placed own goals you’re likely to see all season from Hernán Grana. Racing also underlined the injustice of having to play last week’s clásico against Independiente without their best player due to an international friendly, for heavens’ sake. Giovanni Moreno scored twice in the second half to bring La Academia back from 1-0 down to beat Argentinos Juniors 2-1 in El Cilindro. All today’s goals are right here, as are the goalscorers for the whole weekend. Sam-do you think the officials missed Palermo’s mano or did they consider it inadvertent ? Nearly impossible to miss ! Inadvertent or not, what a goal. As for Funes Mori, a tough break, but honestly I’d like to see that again but from another angle. It looked like he caught it with his chest but we were only shown that one angle. It possibly could have gone off his chest and then his arm. Cappa was spitting nails. Again. I don’t think it’s relevant whether or not Palermo’s was inadvertent (although it clearly was), it’s still a hand ball, he’d already controlled it himself before it happened. As for Funes Mori, there was quite clearly no second contact. The lack of camera angles is one of the more infuriating aspects (from the viewer’s point of view) of the whole Fútbol Para Todos thing, but this video on Olé’s website is clear enough. Indeed, that video is more clear and no mano. Dadgummit ! Pavone wasn’t offside. The header he ran on to actually came from the Godoy Cruz defender. Good spot Justin. The video above stopped streaming halfway through so I wasn’t able to watch all of it (and I missed that much clearer replay when it was shown on the telly). Lovely header by Grana for Olimpo’s goal, showing a deft touch haha. Superb dummy for Racing’s 2nd, who was that?